During the summer months I get up early in the morning and go for a run three or four days a week. The other days I’ll use my elliptical machine, or lift weights, while watching CNBC’s Squwak box early in the morning. About seven weeks ago, with the end of the good weather here in Ontario, I decided to try something different, to avoid the boredom of spending the winter running on a treadmill. I started P90X. For those of you who have someone missed one of their infomercials, P90X is an “extreme” workout routine. It’s not really that extreme, but you need to be in decent shape before you start, and for best results you must be willing to commit to over an hour per day for working out. The program includes a series of DVDs with instructor Tony Horton, and he believes in “muscle confusion”, meaning keep doing something different. So, on Monday I did leg and back exercises, then Tuesday was Kenpo (boxing and kicking moves, for cardio), then it’s back and biceps, then Plyometrics (jump training, also for cardio), then chest, shoulders and triceps, and finally yoga. Yup, yoga, for flexibility. I’ve learned that I’m not very flexible. So here’s the thing: if I’m watching P90X DVDs while working out, I’m obviously not watching CNBC while working out. And you know what? On October 21, when I started P90X, and stopped watching CNBS (I mean CNBC), my main portfolio was up a measly 2.30% for the year. Today it’s up over 14%. So, watching CNBC for 10 months made me 2%, while turning CNBC off and not watching earned me 12 % in just under seven weeks. I realize that with the uptick in gold this year a 14% return is not that impressive. However, my goal this year was capital preservation, so I’ll take it, thank you very much. (And I do have other investments in private placements, that I don’t discuss here since they aren’t available to everyone, and those investments have returned over 100% this year, again no thanks to CNBC). My point: do your own thinking. First, as I reported last week on my thoughts on the Dow, Gold and Pizza, last weekend my wife went on her semi-annual weekend shopping expedition in Toronto. One of her stops was Holt Renfrew, and upscale fashion store. In the past the only sales to be found before Christmas were end of lines and other assorted unsaleable product. This year, apparently, a large quantity of really good, current merchandise was on sale, three weeks before Christmas, for up to 60% off. That doesn’t sound like an economic recovery to me. Lest you think that only high end stores are having problems, yesterday I spoke to a manager at Walmart. She told me things were bad. I asked her why she thought that, and she told me that “when you come into any of the stores in our division (which is made up of many locations), there are never any line ups at the cash registers, which is very unusual at this time of year. We always lay people off after Christmas, but this year we are planning much larger layoffs than usual.” That’s not good. Third, on Friday morning, somewhat belatedly, I decided to get my snow tires installed. (For those of you who don’t live in a winter climate, it’s not uncommon for we Canadians to have two sets of tires: winter and summer. Snow tires have deeper treads, and they are made of softer, more flexible rubber, which is great in the winter, but they wear out faster, so we switch to more durable tires in the summer). I pulled up to my local dealership, ten minutes before opening, as I have done dozens of times before. In the past, no appointment was ever necessary. Today, however, the service advisor advised me that they were quite busy, and had been for quite some time, so appointments were now necessary. Changing tires is about a half hour job, but they couldn’t fit me in. I called another place, and got the same story. I therefore surmise that an increasing number of people are keeping their cars on the road longer, therefore requiring more repair work. Again, not the sign of a recovery. Finally, the New York Times reported yesterday that Christmas will no longer be on credit for many shoppers as the lowest percentage of shoppers in 27 years used credit cards for purchases over the U.S. Thanksgiving Weekend. Visa and Mastercard usage is down 11%. We all know that the economy is fueled by credit, so if the usage of credit is crashing, while that may be good for individual’s financial health, that’s not good for the economy in general in the short term. Consumers are carrying very high levels of debt, and simply don’t want to increase their debt levels any further. So, the real economy is obviously in the dumper, and getting worse. 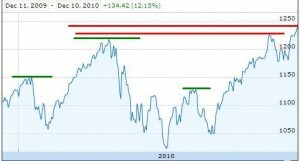 So why does the last year of the S&P 500 look like this? 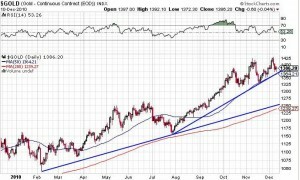 The green lines are what was appearing to be the formation of a head and shoulders top formation, which generally would lead the markets lower. Obviously that didn’t happen. 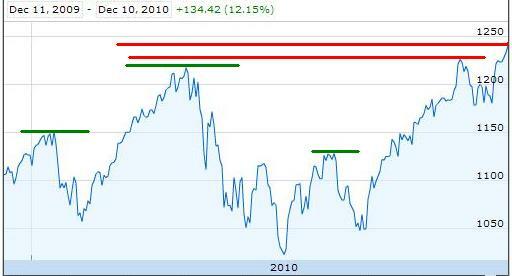 In fact, as the red lines indicate, the market is obviously clearing resistance levels and heading higher. I assume that if the government keeps printing money, and some of that money finds its way to the stock market, the stock market will continue to increase. I therefore have no plans to bet against the government at this time. However, I have no plans to start buying index futures either, since it’s obvious the good times won’t continue forever. The good times may continue for a few months, or a few years, but since I don’t want to be there when the crash happens, I’ll stay out of the way. Even though inflation is low, and the market is strong, investors are still buying gold. In fact, it would appear that we are now down to an obvious support level, so gold is likely to resume it’s upward rise, and soon (probably this week). If you’re a gambler, this might be the week to invest some play money in some calls on the big gold and silver stocks. Of course an even better play, last summer, would have been to buy the uranium stocks, most of which have outperformed gold stocks over the last five months. 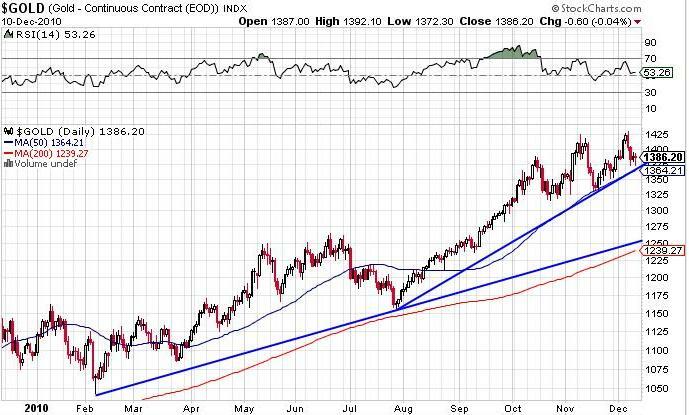 They are looking a bit toppy for me at this point, but perhaps some stink bids on the corrections would be prudent. Those are my thoughts for this morning; I’m off for my P90X workout, and then I’ve got to build the frame for the boy’s outdoor ice rink. Thanks for reading; see you next week.